In honor of October as National Breast Cancer Awareness Month, The Recipe Redux and The Soyfoods Council have teamed up for a “How to…Tofu” Recipe Challenge to encourage people to eat more soy in their diet. Soy has great nutritional benefits, including being a high-quality protein source, and research indicates that it may play a role in reducing the risk for some chronic diseases. Tofu, made from soybeans, is one of the most versatile soy ingredients as it can be used in a number of ways and really absorbs the flavor of other foods with which it is paired. We actually love tofu at our house and use it a number of ways, though primarily in a main dish. I love finding new ways of cooking tofu, whether it is the star of the dish, or a supporting player. 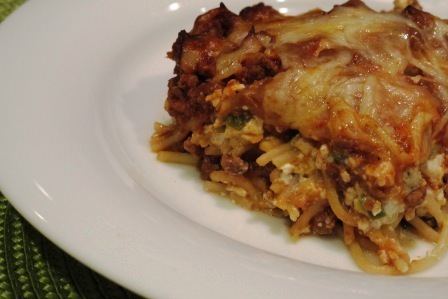 I like experimenting substituting it for other ingredients, and not just meat, which is one of the reasons I chose this particular casserole for a redux. Growing up in the South, I ate a lot of casseroles. You can’t be a true Southerner without having at least one good casserole in your repertoire. My mother and my grandmother are both outstanding cooks. While casseroles were not all we ate, they certainly were on the table frequently. I have fond memories of one in particular, a spring onion casserole. I don’t remember the last time I had it, but it was many years ago. Recently one of my sister’s went digging through my mother’s old recipes and found it. In looking at the ingredients, it screamed for a makeover (um, browning the ground beef in butter really isn’t necessary!) and using tofu in place of the cream cheese seemed like a natural substitute. For those that don’t like tofu or have never tried it, they will never know it is there! While my husband and my son have never had the original recipe, they loved my version. And I have to admit, I love how it turned out too! The green onion smell as soon as I brought it out of the oven took me back many years to my parents dining room table. I couldn’t wait to dig in! And I’m looking forward to leftovers tomorrow as I’m sure the flavors will intensify and brighten overnight. This would be a great dish to make ahead and then take to a friend with a new baby or anyone who could use a comforting meal. Be sure to check out my colleagues How to…Tofu recipes at the bottom of this post for more inspiration on getting more tofu in your life. A makeover of one of my favorite childhood casserole recipes to incorporate tofu while lowering the overall fat and calories. Cook the noodles in boiling water until al dente, or still firm to the bite. While noodles are cooking, brown the ground beef. Once meat is no longer pink, add the mushrooms and garlic and cook an additional 3-5 minutes or until mushrooms are soft. Add salt, pepper, sugar, soy sauce and tomato sauce to the meat mixture. Bring to a boil then simmer covered for 15 minutes. Combine tofu, sour cream and green onions in a bowl and stir well, breaking tofu into small pieces. In a greased 9x17 pan, put half of the noodles in the bottom. Top with half of the tofu mixture and then half of the meat mixture. Repeat layers. Top with mozzarella cheese. 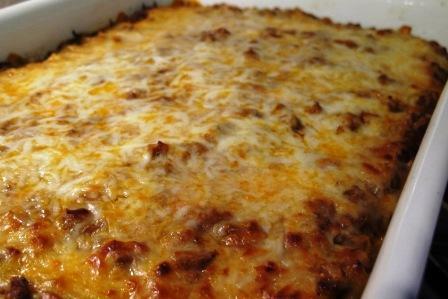 Cover with aluminum foil and bake for 30-45 minutes or until heated through and cheese is melted. Disclosure: By posting this recipe I am entering a recipe contest sponsored by The Soyfoods Council and am eligible to win prizes associated with the contest. I was not compensated for my time.